After placing fifth at the state wrestling tournament, Cayden Henschel grabbed his video camera. Henschel, a sophomore at West Bend East High School, is known for being one of the top wrestlers in the state, but he is becoming more popular due to his YouTube vlogs which highlight his daily life. He started posting videos last November. Vlogs are “video logs” similar to daily journals that have become quite popular in the YouTube community. Henschel, who placed fifth in the 126 pound division Feb. 24 at the state tournament in Madison, was inspired by his friend and fellow teammate, Crosby Schlosser, to start making vlogs five months ago. “I saw Crosby doing it and I saw how popular YouTube was becoming, so I just wanted to get involved and see what could happen,” Henschel said. These videos give viewers a glimpse into Henschel’s daily life. They include his morning workouts, family gatherings and time spent with his friends. Henschel has two brothers and twin sisters which adds to the excitement of events such as birthday parties, holidays, or vacations which might otherwise be considered ordinary. His wrestling vlogs are consistently his most popular videos because of the highlights he includes from his and other teammates’ wrestling matches. After only a few months, Henschel has acquired 390 subscribers, many of whom are classmates and other wrestlers. In addition, five other East wrestlers, including Schlosser, Bryce Henschel, Brady Schmidt, Aden Orth and Damian Zapata, vlog as well. Other teams from the North Shore Conference have taken notice of their YouTube channels. Henschel says consistency is key when vlogging. He tries to upload as often as he can while still focusing on school and wrestling. The most viewed video Henschel has produced is his first one, which shows viewers how to get a popular brand of clothing, Anti Social Social Club, for retail price. It has over 9,000 views. He says he tries to use keywords in his title that are often searched to be discovered more often. Other popular videos include his regional, sectional and state wrestling vlogs. YouTube is potentially a way to make money and become famous but Henschel says that he also has more practical reasons for making his channel. In a time where social media is growing so rapidly, Henschel doesn’t want to miss his chance. Vlogging is becoming a family activity in the Henschel house, as Cayden’s brother and teammate Bryce Henschel has started vlogging too. Besides the wrestling team and family members, Henschel also includes his friends and neighbors in the videos. Another way Henschel is using his talent is by helping East athletic director Denny Ziegler to edit his new “What’s Up East Suns” videos which highlight different sports and athletes throughout the year. Ziegler says that what really sets Henschel apart from other athletes is his preparation, work ethic and mental toughness. He believes that all of these factors drive Henschel to be the best version of himself in everything he does, whether it be athletics, school or YouTube. Henschel is unsure of what he wants to do in the future, and while wrestling in college is an option, he’s not dead set on it. 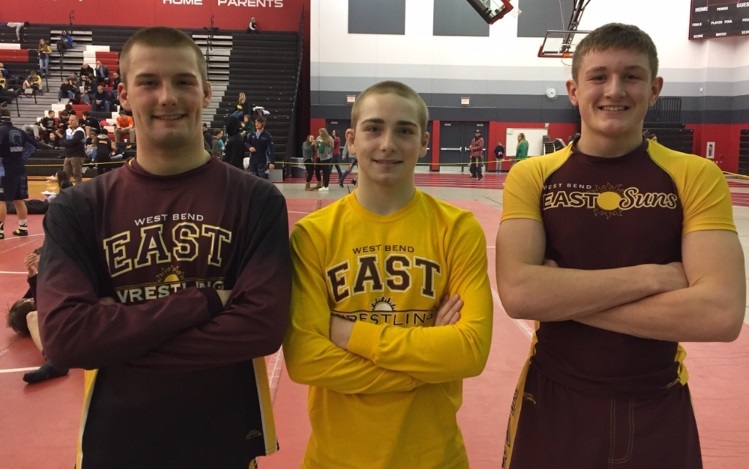 Cayden Henschel, middle, with Bryce Henschel, left, and Cooper Schlosser after sectionals on Feb. 17. Cayden and Cooper placed first, Bryce placed second. Photo courtesy of Cayden Henschel.